The structure which is known as the tomb of Sultan Mustafa I and Sultan Ibrahim I was the former baptistery of the basilica and was one of the major annex structures of Hagia Sophia complex. It is covered with a rimless dome and has an octagonal internal layout. 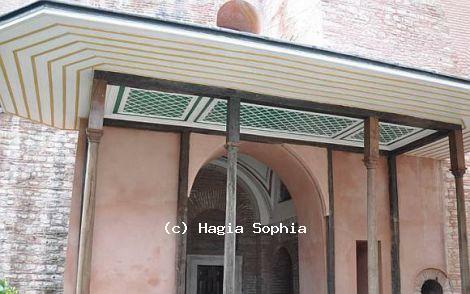 Before converted in to a tomb, structure had been used as a storage room for lamp oil for a while in Ottoman period. Mustafa I who died in 1639, Ibrahim I who died in 1648 are buried here. Including Mustafa I and Ibrahim I, there are a total of 19 sarcophagi in the tomb. Daughters of Ahmet I and daughter of Kaya Sultan of Murat IV, sons and daughters of Ahmet II and some other members of the dynasty are buried in structure.